A new version is almost done. I have incorporated more external hardware, particularly the Hog2. It has fixed the latency issues and has the same sound quality. All is done, and there is a much cleaner sound. The last issues are figuring out issues with the intelligent harmonizer. The idea of expanding the guitar has always been of great interest for me. There has been a number of implementations that I have tried over the years. 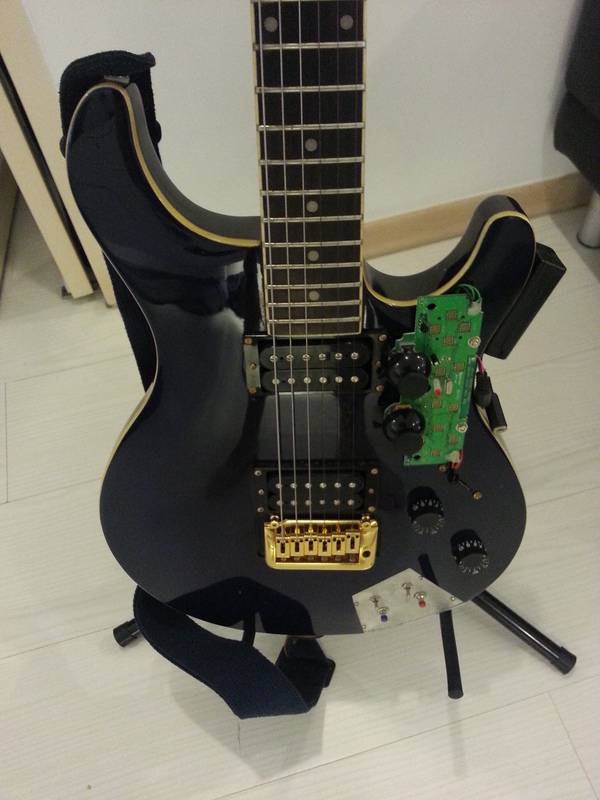 I currently have a hacked guitar, courtesy of John Stewart Jackson and now have a software in an Alpha testing state. The hardware consists of a head-stock pickup, and a built in gamepad with 2 mini-joysticks, 2 switches and 2 buttons, as well as a small MIDI foot controllers. 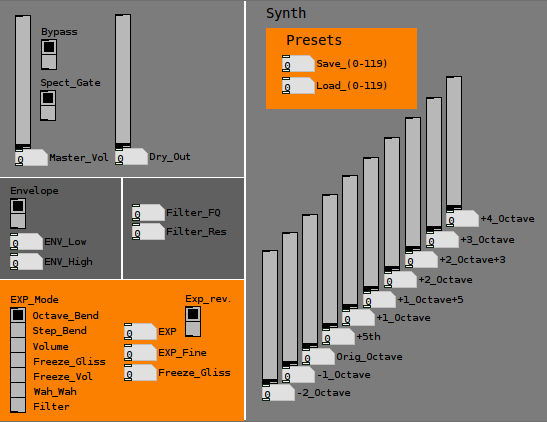 The software has a harmonizer (with an intelligent counterpoint improvisor that I wrote), waveshaping, and an FFT dynamically variable FFT filter. The intelligent harmonizer allows for the guitar to listen to what is being played and then decide on a reasonable counterpoint. The software learns to play certain pitches based on a determined pattern that is set by recording pitch tracked information. The length of the recording is determined by the performer. The FFT filter allows for a painting of filter graphs using the joysticks. The filter allows for over-driven sounds, to filtering any or all frequencies to infinite. The current implementation is V0.16. It is able to emulate the articulation and color expressiveness of a wind instrument. Future updates on the instrument will increase the organic nature of the instrument creating a richer sound pallet. Work will continue on this instrument throughout 2013, do what for updates and new videos. The current demos are based off of one of Messiaen’s bird songs. They are part of a series of improvisations. In the next state of the guitar there will be a recording of the clarinet solo from Quartet Pour Le Fain de Temps.